As a first step please visit 'Settings' in the Tresorit for Windows App and confirm that you have DFO and/or Tresorit Drive enabled. Check if Direct File Open (DFO) and Tresorit Drive are enabled. If the toggle buttons are gray, then the app is processing your request at the moment. Wait until Tresorit is done with processing before your proceed. If there's an issues detected error message under Tresorit Drive, then you are probably experiencing network issues. The orange ribbon on the bottom of your screen indicates the same issue. Start the diagnosis by clicking Resolve issues. You will need administrator rights on your PC to continue. The notification should disappear in a few minutes. If this didn't didn't solve your issue, read on to continue the diagnosis. Automatic proxy detection on Windows can cause significant delays in DFO and Tresorit Drive operations. 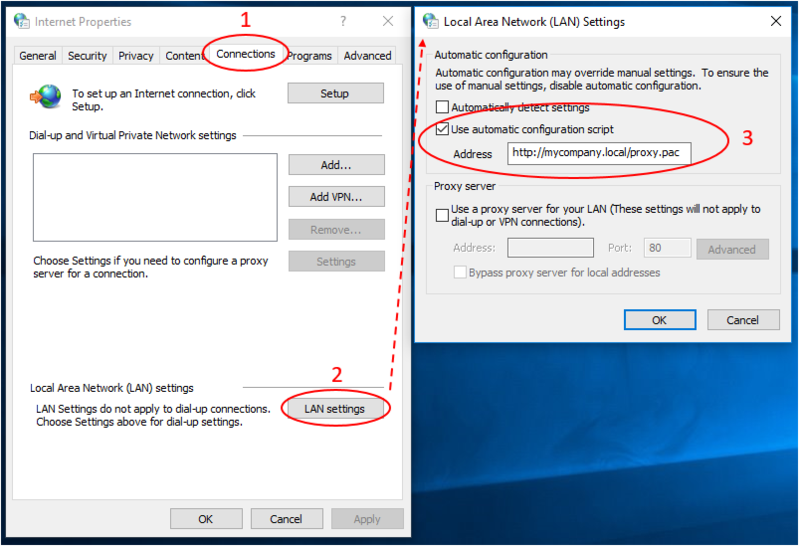 If you are not under a company proxy perimeter, you can speed up these operations if you disable the automatic proxy detection of Windows. Click the LAN settings button on the bottom. Uncheck the box left of Automatically detect settings. Learn more at Windows Support. To set up DFO / Tresorit Drive add "drive.tresorit.com" to the proxy exclude list and please also make sure to opt for direct connection. If you are using manual proxy configuration then Tresorit Drive will be added automatically to this exclude list. 📝 Note: drive.tresorit.com points to your local machine [127.0.0.1] where Tresorit runs, so no proxy required to make it work. If you use your company's proxy then there is a chance that automatic configuration of the exclude might fail. You can check if this if the issue under LAN settings. Uncheck the box left of Use automatic configuration script. For proxy administrators: Update the PAC file to match the following script. If needed, consult your proxy server's documentation for further investigation. Tresorit needs the Windows WebClient Service to run DFO and Tresorit Drive. Check if it's up and running. Open the Services application or execute services.msc from the command line. The Status should say Running. The WebClient Service is not installed on the server versions of Windows by default. Open the Windows Features application. Turn on the Desktop Experience feature. If you cannot reach Tresorit Drive after restarting your machine, set the WebClient service's Startup Type to Automatic. WebDrive: WebDrive seemingly intercepts and blocks the communication between your machine and Tresorit Drive / DFO. As of now, the only workaround known to us is uninstalling WebDrive.